The Super Intelligent Footswitch is the perfect match for our award winning Microtubes 900 Amplifier. It allows for easy access to the wide tonal options the amplifier offers: Clean channel, Vintage Microtubes and Microtubes B3K overdrives and Mute are now a stomp away. 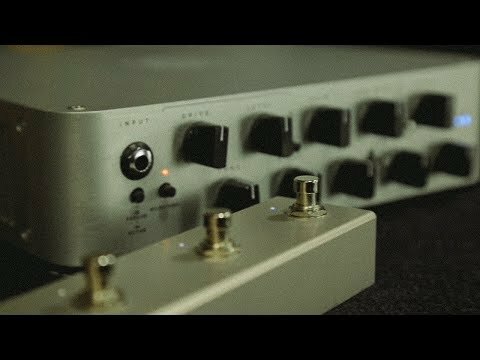 Clean - Crisp, transparent and incredible versatile clean channel with 4 Band EQ. VMT - Will bring up the mids for a warmer, more neutral character of our Vintage Microtubes. B3K Will deliver an aggressive, percussive sound of our Microtubes B3k. Mute - Mutes the amplifier for tuning or other purpose. Specs: Length: 220 mm - Depth: 45 mm - Height with buttons: 48 mm - Weight: approx. 450 g.
Do you own Darkglass Super Inteligent Footswitch or have you had a chance to try it?